British holidaymakers have been encouraged to explore the eastern side of Turkey. Although the eastern parts of the country have a number of travel destinations, many tourists are yet to make a trip to those places, according to a travel writer. It could prompt more people to take out a comprehensive travel insurance policy and go on a holiday exploring new areas. 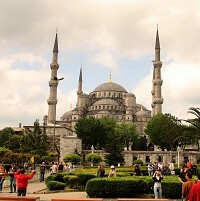 Diana Darke, an author for Bradt Travel guides, said: "The unique and surprising thing is what a contrast it offers to Istanbul and the cosmopolitan western half of Turkey with its sophisticated coastal resorts: it really is Turkey's other face, the unknown face." Ms Darke said travellers can visit Hasankeyf, an ancient town and district located along the Tigris River. She described it as sitting "on a dramatic gorge overlooking the Tigris". Meanwhile, they can also go to see the Kurdish city of Diyarbakir and the monasteries of the Georgian valleys.